Credible rumors that it has appeared in Verizon's systems for a short time before disappearing mysteriously - including local stores having to return demo and display models. Confirmation from Palm that the Verizon Pre 2 was still set to be released "in the coming months." Fast forward to today and, well, we think we can safely say that the Palm Pre 2 won't be released in 2010. As for 2011, we tend to believe Palm's confirmation if only because an anonymous tipster sent in the above scan from Best Buy's inventory system. 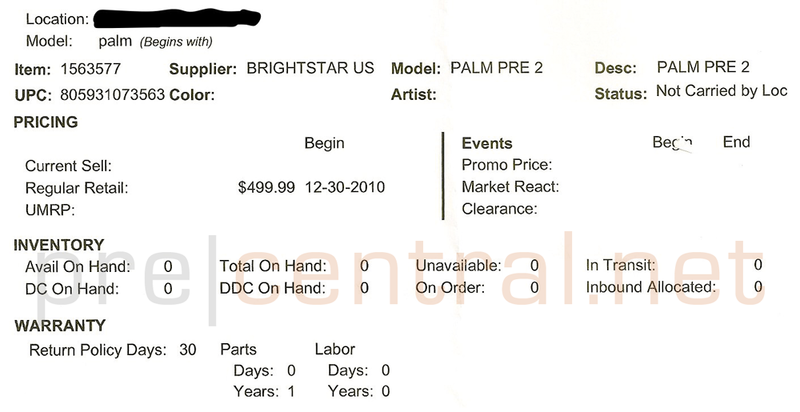 The Verizon Palm Pre has popped up there with a price of $499 attached (nevermind the 12-30-2010 date on the image). Sadly, no indication of when the phone will actually be released yet, but spotting a nest made for a unicorn is better evidence than merely hearing promised that a horned horse will appear in the coming months, if you catch our drift. It's been nearly two and a half months since the Pre 2 was announced, so it's not crazy to wonder what the hold up is ....and whether releasing the Pre 2 on Verizon even make sense given what we hope is an aggressive 2011 phone roadmap.